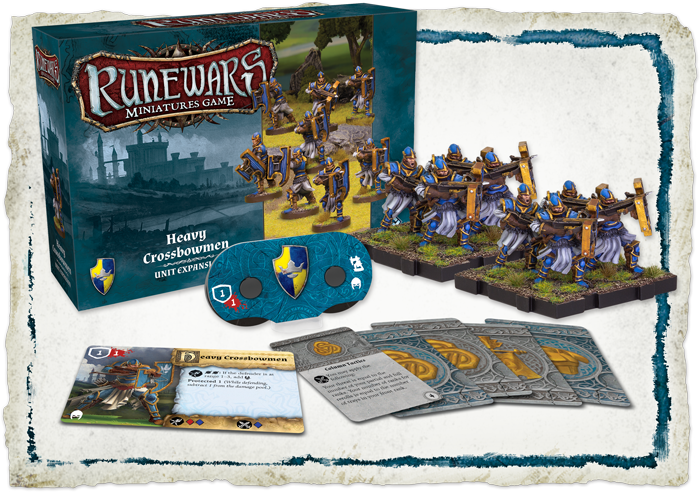 The Heavy Crossbowmen Unit Expansion for Runewars Miniatures Game comes with eight Heavy Crossbowmen plastic figures and two plastic infantry movement trays, allowing players to add a two-tray unit to their Daqan Lords forces in battles for Terrinoth. This is not a standalone product. It requires a copy of the Runewars Miniatures Game Core Set to play. Paragons of disciplined training and wielders of some of the most sophisticated military weaponry available, the heavy crossbowmen of the Daqan Baronies represent one of the greatest defensive forces in Terrinoth. Armed with specially designed bulwark shields and heavy crossbows, these warriors can withstand even the fiercest hail of enemy fire while unleashing their own torrent of death. The Heavy Crossbowmen Unit Expansion for Runewars Miniatures Game comes with eight Heavy Crossbowmen plastic figures and two plastic infantry movement trays, allowing players to add a two-tray unit to their Daqan Lords forces in battles for Terrinoth. Additional tokens and five upgrade cards allow you to expand your Runewars Miniatures Game collection while customizing your armies!